Schreiner, Thomas R. 40 Questions About Christians and Biblical Law. 40 Questions Series, ed. Benjamin L. Merkle. Grand Rapids: Kregel, 2010. Initially I was a bit skeptical about the catechetical-like forty question format. But 40 Questions about Christians and Biblical Law by Thomas Schreiner has helped to ease, if not erase, my doubts about the format. Any book that is based on a question-and answer-format should be evaluated both on the quality of questions that are asked and the quality of the answers that are given. 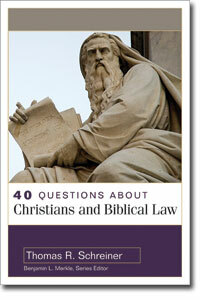 In 40 Questions about Christians and Biblical Law, I found Schreiner’s questions and answers to be excellent and helpful. The questions asked are significant (questions that are worth asking), succinct (the questions are clearly and concisely stated), and logically sequential (the questions are asked in a logical progression). Schreiner’s answers are also praiseworthy. The pertinent issues are explained and fairly presented, and the author’s view is clearly stated and argued. One might disagree with Schreiner’s answers, but one will not have to wonder what he believes and why. Sprinkled throughout are helpful tables (see pp. 20, 43, 93, 125, 210). There are five additional features that add to the usefulness of this work. First, I like the fact that this book has footnotes (not endnotes), which provide the interested reader additional information. Second, I appreciate the summary paragraphs that close each chapter. Third, the inclusion of reflection questions will allow this text to be used in the classroom or a small group study. Fourth, there is a four-page annotated bibliography. And finally the book has Scripture and ancient sources indices. In sum, Schreiner masterfully addresses the main issues in what is a complicated, and at times, contentious, topic. Whether you have one question or forty about the relationship of Christians to the biblical law, this volume is an excellent resource of both introduction and investigation.